Pregnancy holds a special space in most societies, it is a biological necessity for species preservation and represents the promise of future generations. Pregnancy is thought by many to bestow upon women an extra layer of societal protection and care. Social conventions dictate that pregnant women be given priority seating on buses, trains and other forms of transport and in lines for rest rooms and priority rescue during natural disasters. We believe ourselves to be solicitous and helpful to pregnant women and accord them an extra measure of respect. But in many ways in the United States the treatment of pregnant women has been and continues to be class specific. Poor and working-class women often find pregnancy a difficult time, especially if they have jobs that don’t offer health care benefits, sick time or maternity leave. Those challenges can make pregnancy difficult enough without the extra worry of health care providers and/or aggressive prosecutors looking over your shoulders and sometimes even examining your urine to make sure you aren’t engaging in activities they consider ‘harmful’ to your fetus. In the aftermath of the crack cocaine media hysteria of the 1980s, laws that were enacted to give more protection to women who were physically assaulted while pregnant – began to be used against pregnant women. Punitive prosecutors and anti-choice advocates promoted the idea that the most dangerous place for certain children is their mother’s womb. “Tennessee has become one of the top states for babies born addicted,” says Weaver, who introduced the bill in the House. The legislation is just the latest in Tennessee’s series of efforts to deal with a rise in infants born with Neonatal Abstinence Syndrome (NAS), which is a group of problems akin to the effects of withdrawal. Another major problem with Tennessee’s proposed law is that it ignores the fact that legally prescribed narcotics can also result in NAS. Though the Tennessee Department of Health declined to comment for this article, its commissioner, Dr. John Dreyzehner, has previously said that although NAS is a problem in his state, abuse of illegal narcotics really isn’t the root of it. “In Tennessee we know that 60 percent of the babies born to mothers, the babies that develop Neonatal Abstinence Syndrome, their mothers had a prescription for the medication they were taking,” he said. But doctors and lawyers interviewed for this article said it is not always easy to definitively conclude what substance produced NAS in a child. Thus, there is potential for women to be wrongly charged under this new law, even if they were taking legally obtained drugs. There are 177 addiction treatment centers in Tennessee, but only two offer prenatal care on site. Only 19 offer any services for pregnant women. Methadone, the evidence based treatment known to work best for pregnant women who are using opiates is not among the treatment options available. Proponents of the measure point to the mandated review of its efficacy and impact after two years and that it classifies the new crime of ‘fetal assault as a misdemeanor instead of a felony as ameliorating factors. Somehow I think that’s a distinction without a difference for women who would forego prenatal care and not risk arrest for any reason, not to mention the notorious tendency of prosecutors to overcharge in order to facilitate plea agreements. Once the door is open to criminalizing women’s behavior during pregnancy, it’s hard to limit the impact. One can’t help but wonder whether there is any connection between Tennessee becoming the first state to enact legislation that would make women subject to criminal punishment because they became pregnant and failed to meet societal expectations and its distinction as the corporate headquarters of the nation’s largest private prison company – Correctional Corporation of America (CCA) – which already operates 3 of the state’s 14 prisons. Since its founding in 1983, CCA has profited from federal and state policies that have led to a dramatic rise in incarceration in the United States — a rise of 500 percent over the past thirty years (the U.S. population has only increased by 40%). Although it claims that it has not lobbied for bills that extend or increase sentences for prisoners, for nearly two decades CCA participated in and even led the task force of the American Legislative Exchange Council (ALEC) that pushed bills like so-called “truth-in-sentencing” and “three strikes” legislation as models for states to adopt across the nation. CCA and its hired lobbying firms have spent about $30.9 million lobbying Congress and federal agencies from 1998 to August 2013 on bills relating to immigration, detention, and private prisons. CCA wields tremendous political influence in Tennessee under the current administration. In 2011 Gov. Bill Haslam found nearly $31 million in recurring money to keep open a CCA prison in West Tennessee while making deep cuts to other areas such as TennCare and higher education. His decision stood in sharp contrast to his predecessor, Democratic Governor Phil Bredesen who had sought to close the facility. According to the website Influence Explorer, which tracks political contributions, Governor Bill Haslam was among the top four recipients of campaign contributions from CCA – remarkably, two of the other four top recipients are also Tennessee elected officials – Senators Lamar Alexander and Bob Corker. Earlier this month Trousdale County entered into contracts for a new 2,500 bed state prison in Hartsville, Tennessee that will be run by CCA. 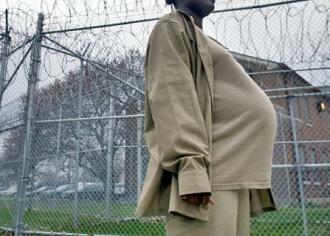 The expressed correctional needs of Tennessee now include the potential incarceration of pregnant and childbearing women for ‘harming’ their fetus by using illegal drugs while pregnant. Of course we now know there’s no such thing as a “crack baby” and exposure to cocaine in utero while not advisable, is not nearly as harmful to fetal development as smoking cigarettes or drinking alcohol, neither of which will get a pregnant woman arrested and hauled before a judge. But hey – why let science get in the way of a making profit from the warehousing of human beings? Most people who care about reproductive justice are aware of the many actions by state lawmakers throughout the country to restrict women’s access to abortion by various means including: creating new restrictions on abortion providers; mandating waiting periods, pre-abortion counseling and medically unnecessary sonograms and requiring women to have special insurance to cover the costs of abortions. Not satisfied with making it more difficult for women to get access to both contraception services and legal terminations, anti-choice advocates now seek to make women criminally liable for the outcomes of their pregnancies. These are not isolated incidents, they’ve become increasingly common as pregnant women are used as pawns in the fight to erode reproductive justice. As documented in a recent report by National Advocates for Pregnant Women, in the decades since Roe v. Wade there have been hundreds of criminal and civil cases involving the arrests, detentions and equivalent deprivations of pregnant women’s physical liberty between 1973 and 2005. The consequences to pregnant women included: arrests; incarceration; increases in prison or jail sentences; detentions in hospitals, mental institutions and drug treatment programs; and forced medical interventions, including surgery. State authorities have used a variety of measures including feticide laws and anti-abortion laws recognizing separate rights for fertilized, eggs, embryos and fetuses as the basis for depriving pregnant women – whether they were seeking to end a pregnancy or go to term – of their physical liberty. The crusade against women’s reproductive rights has been led by politicians and organizations that claim to cherish the “right to life” and champion women’s role as mothers. But the reality made painfully clear by the NAPW’s report is that the anti-choice right wants women to be treated as second-class citizens, denied the right to health care, personal liberty and the right to control their own bodies and lives. In all, just over half of the women whose stories are collected in the report are Black. Nearly three-quarters of those facing legal charges were represented by indigent defense. African-American women have suffered a long legacy of barbaric discrimination–from the separation of families under slavery to the early 20th century eugenics movement that pushed through laws in 32 states allowing the sterilization of women judged “unfit to breed.” Today, poor Black single mothers are scapegoats for all manner of social problems. In particular, the war on drugs has served as a vehicle for the attack, with drug convictions serving as the excuse for terminating parental rights of incarcerated mothers. 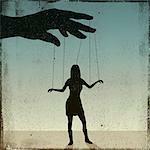 Like the puppeteer, the life being manipulated here is incapable of acting on its own. It has no free agency and is totally dependent on the woman who nurtures and nourishes it. To set them in opposition to each other and ascribe independent agency and rights to a fetus makes as much sense as asserting a puppet can speak without a ventriloquist and awarding it the right to sue for wage theft. In DeBerry’s view being pregnant while imperfect is a crime. I guess DeBerry missed the part where Jesus advised, ” let he who is without sin cast the first stone”. Who benefits from promoting the fiction of ‘fetal personhood’? It does nothing to empower children, who lack the agency to be ‘persons’ politically, but it is an effective tool to disempower women and the people, who love, support and depend on them, including the children they already have. 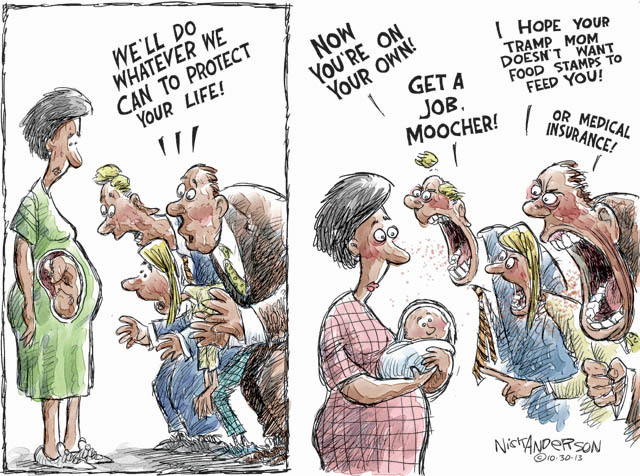 The reality is ‘fetal personhood’ seeks to accomplish similar results as the “3/5 compromise” on the personhood of slaves – facilitate the economic and sexual exploitation of vulnerable women for the political and financial benefit of others. I end with Jay Smooth of Ill Doctrine discussing yet another tactic by the anti-reproductive rights movement to persuade the public to end women’s access to safe, legal abortions and the full range of reproductive health care. Surprisingly, it’s a tactic we should all get behind as it represents a rare win-win for all. This entry was posted in News and Views, Politics and tagged abortion, addiction, African American, anti-choice, CCA, child endangerment, choice, christian beliefs, contraception, Correctional Association of America, crack cocaine, criminalization, drug use, drugs, fetal rights, freedom, incarceration, Politics, poverty, power, prisons, private prisons, profit, prosecution, religion, reproductive freedom, reproductive justice, reproductive rights, Tennessee, war on drugs, women. Bookmark the permalink.